Atkinson candies had prepared a Halloween-inspired version of their crowd-favorite Chick-O-Sticks. 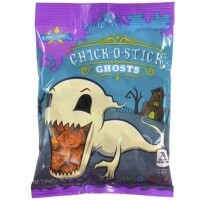 It’s the classic peanut butter and coconut taste in an eerily ghostly wrapping that’s guaranteed to thrill any snacker. The best part? These candies are kosher, vegan, and gluten-free- thoroughly delicious for everyone! Cane sugar, corn syrup, peanut butter (fresh ground dry roasted peanuts, salt, antioxidant E307 (vitamin E) to preserve freshness, toasted coconut, colors E100ii-E127-E129*-E133, natural red color (vegetable juice concentrate), natural vanilla flavor. Manufactured in a facility that also processes peanut and uses milk, tree nuts (coconut, pecans). *May have an adverse effect on activity and attention in children. Contains GMO. Nutrition facts (for 100g): calories 412Kcal, total fat 14.7g (saturated fat 5.9g), total carbohydrate 70.6g (sugar 47.1g), protein 5.9g, salt 0.4g.